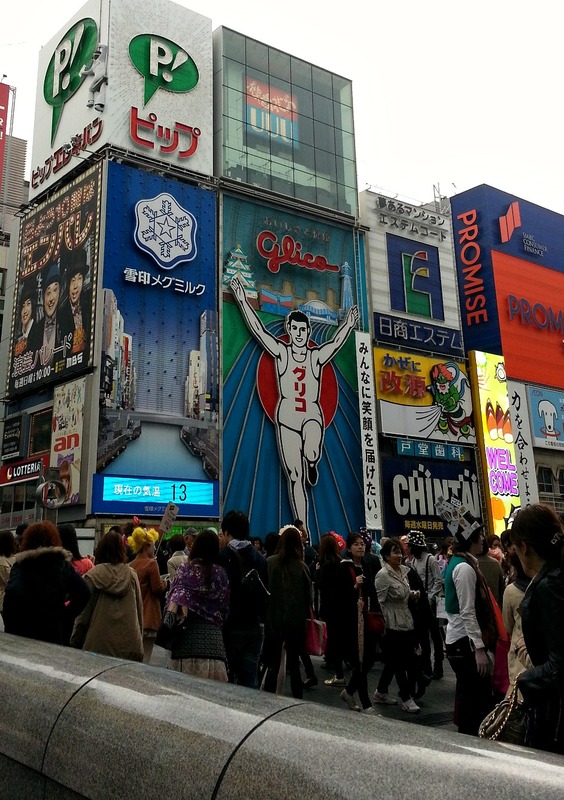 A tourist when in Osaka will never be considered a complete holidaymaker if he misses taking a photo of (or with) the iconic Glico neon signboard. 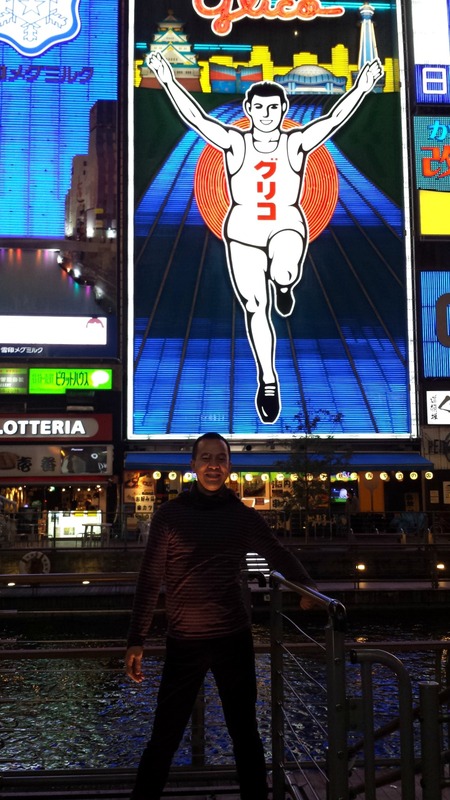 The ginormous nightly lighted panel is located at downtown Dotonbori district. The Ezaki Glico Company’s triumphant running man with raised arms on a blue track with Osaka Castle, Tsutentaku Tower and Osaka Aquarium Kaiyukan in its background has long been considered an amusing landmark in Osaka. 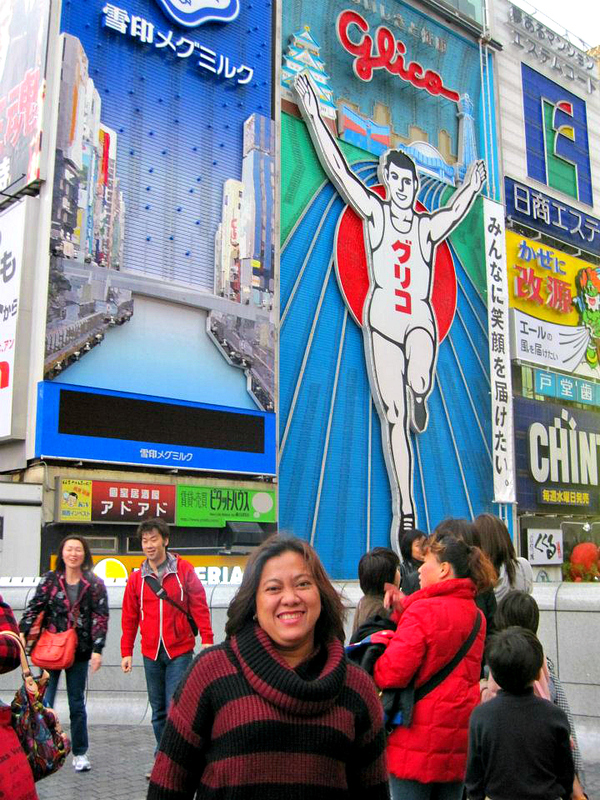 But during my trip with Nengkoy this October 2014, while walking along my favorite Shinsaibashi strip, my pamangkins (nieces and nephew) shocked me when they said that Glico has transformed into a woman. I just brushed their story and obviously did not believed them. But when we get to the Ebisu Bridge of Dotonbori-gawa River, I was stunned! 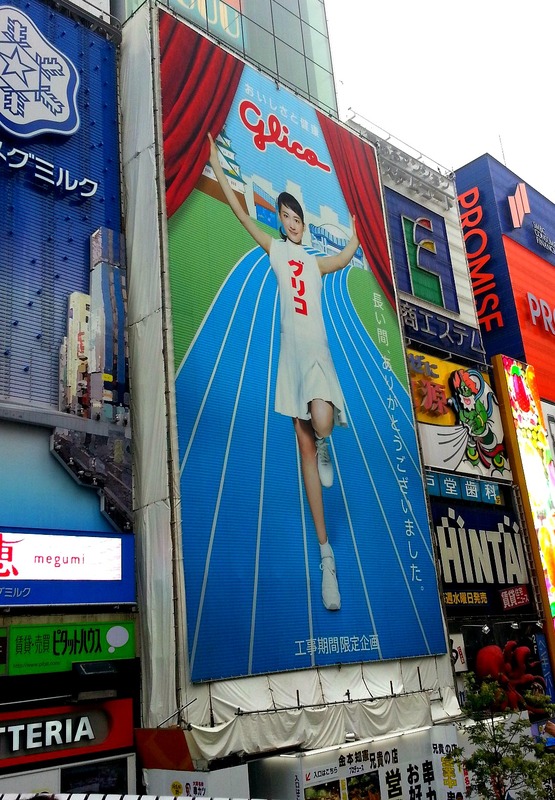 The massive display panel was covered with a tarpaulin, in which printed on it is a lady in exactly the same position of Glico with the same background. When I asked my pamangkins – with a very worried face – on what happened, they smiled and told me that the iconic signboard is undergoing revamp and overhaul. They immediately told me to take a photo since it would be one of the rarest events in Osaka when the treasured symbol is temporarily bugged and preoccupied. True enough, according to news the well-adored signboard will no longer be made of neon lights but will instead be LED powered already when it is re-lighted. When I asked who the lady on the photo was commissioned to pose ala-Glico-like, my nephew told me that she was like the Marian Rivera of the Philippines. (Marian Rivera, the two-time FHM Magazine’s sexiest Filipina is a mega icon celebrity in the Philippines who is also very popular in other South East Asian countries). Nangawit lang pala kaya nagpahinga… Aym shur, estatwa ni Rizal sa Luneta pag-nirepeyr, rebulto ni Kris Aquino ang ipapalit.